Ahh, your 20s! This decade is chalk full of exciting changes and discoveries. Whether it’s becoming a #girlboss, hunting for that special someone or finally figuring out how to fold a fitted sheet, adulting can be a challenge. But when it comes to fashion, your 20s are all about having fun, trying new things and building a seriously good closet that represents exactly who you are. If you’ve ever shied away from trends because you’re worried you might not be able to pull it off—try it anyway! Your 20s are your time to figure out what you like. Try to push aside your doubts and take this opportunity to channel your inner Beyoncé. Experimenting with different looks is the best way to discover what works for you and get a sense of who you are. There’s no rush to define your personal style, so take your time dipping your toes into different style pools! There could be days when you want to don your girliest dress and other days when leather leggings call your name. Don’t assign yourself to any one, specific style just yet. Your tastes are bound to change so make sure your closet is prepped with plenty of variety. Suede is a luxe texture for sure but don’t be reckless and wear your suede mules during a downpour. Protect your leathers and suedes, use your shoe boxes when possible and even consider having an investment pair of flats or loafers resoled when they get a little tired looking. Your shoes are the foundation of every ensemble and a well-cared for pair can really cement that, “I’ve got it together” vibe. Dressing the part is everything when it comes to interviews. This is your first impression to potential employers and your 20s are all about jumpstarting that career. Be prepared to have professional looks at the ready. A blazer is an absolute must, as is a sharp pair of modest, timeless heels, (kitten heels are back in a big way right now!) Be detail-oriented and don’t hesitate to invest in tailoring to ensure spot-on fit from trousers to blouses. By now, you probably know a thing or two about your style tendencies; like what colors appeal to you and the fit and silhouettes that work for your shape. Trust your intuition but also experiment bravely with your style to create a blend of aesthetics that feels authentic and 100% you! Whether it’s finding denim that fits (Seriously, we can’t stress this enough!) or ensuring you’ve got classics like a crisp, white button-down or a little black dress handy, there are definitely essentials that belong in every woman’s closet. Once you find the perfect leather jacket, you’ll quickly realize that it instantly adds a cool-girl vibe to just about any outfit. Pair it with a tee and boyfriend jeans for a little more structure or pair it with your favorite dress for chillier nights out. Chances are, you’ll wear it a lot, so invest in a quality jacket that you can rely on for years. Your 20s will likely be full of celebratory occasions, weddings, baby showers, etc. (trust us, the list goes on) so find yourself a killer pair of party shoes and you’ll be ready for any invite headed your way. We’re talking statement-making, eye-catching shoes you wouldn’t wear on the day-to-day. Opt for a bright color, a funky animal print or even a metallic shoe and you’ll never face the “I don’t have anything dressy enough to wear” conundrum again—your party shoes will elevate even the blandest of ensembles. As you navigate your 20s, you start to realize that certain staples are worth investing in. A well-made leather bag in a neutral color will get you through your 20s fashionably and with better odds of not losing your credit card again. Foundation pieces are included the term, “foundation” for a reason—they’re the base of all outfits. Since just about any outfit is going to require at least one foundation piece, make sure you’ve got your bases covered in all wardrobe departments. A pair of dark-wash, figure-flattering skinny jeans are a non-negotiable item every woman needs. We all deserve to put on a pair of skinny jeans and feel like a million bucks so do your research, figure out what rise and inseam works best for your shape and add the perfect pair of skinnies to your closet. Wear them to work or wear them to the movies—the possibilities are endless. From date night to girls night to even a laid-back wedding, your little black dress will always have you covered. Once you find one that hugs you in all the right places and flaunts your favorite features, keep it at the ready—there’s no occasion it can’t handle! It’s time to let go of tired flip-flops that have seen their best days or that ancient tee you associate with a great night and ignore its holes and fading. Don’t weigh yourself down with items that are no longer serving you when you make the transition to your thirties. Be critical! If it doesn’t fit, you haven’t worn it in six months or more or if there’s any sign of pilling or color fading you’ll thank yourself for purging these and starting fresh with pieces worthy of your wardrobe. Logo/worn-out tees: What used to offer cool-status now sends juvenile vibes. Keep it simple with modern prints and solids and avoid brand-name labels and definitely dump anything washed out, sagging and generally tired. Bodycon Dresses: Even if showing off your shape is your preference, those dresses that overly cling to your curves are best-left in your past. Booty Shorts: This is a hard no. Exposing more than what’s necessary of your backside is never stylish past a certain point in your life. Ill-fitting Garments: Few things crash your style credibility like clothes that don’t hang like they should. Be aware of where inseams, shoulder seams fall and overall size and purge what doesn’t do right by your frame. Owning your style in your 20s is all about trying new things and developing an understanding of what works for you (and what definitely doesn’t!) With a creative, caution-to-the-wind outlook and a firm hold on what feels good, this decade could prove to be the most adventurous time of your life! 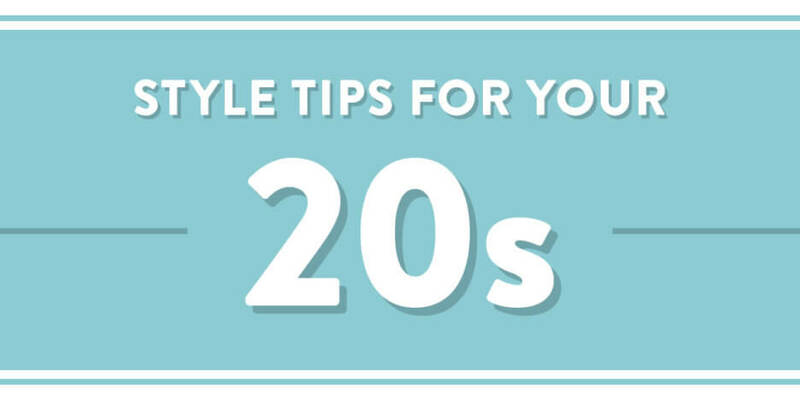 Have tips of your own for dressing in your 20s? Tell us and your fellow fashionistas in the comments!